The new owner of the former James Street Baptist Church came in front of Hamilton’s Heritage Permit Review Sub-Committee on Thursday to present their version of the proposed tower which was previously approved by City Council in January 2015. Hue Developments was the winning bidder in a bankruptcy sale of the property following the financial collapse of Louie Santaguida’s Stanton Renaissance. Hue Developments is partnered with LCH Developments to develop a modified version of the 30-storey Connolly that City Council approved. 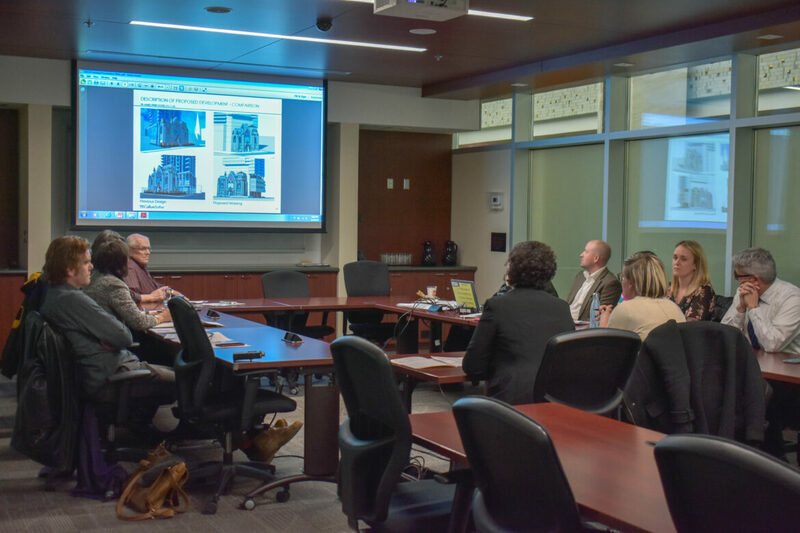 As their first public step, prior to formal application submission to the City, the development group presented to the citizen advisory Heritage Permit Review Sub-Committee. The modifications are primarily to the front of the project, moving balconies forward from the original proposal, and the design is more contemporary. The ground level interfacing with the surrounding street continues to incorporate pedestrian friendly design and landscaping, and the first floor interior is similar in concept. Read Coleman’s companion Editor Note on why the front facade is important to the new owners, and why Coleman doesn’t see “demolition by neglect” as a concern. Discussion at the Sub-Committee focused upon the guarantees for the preservation of the remaining front facade of the former church. City Hall, behind closed doors consulting with Ward 2 Councillor Jason Farr, allowed for the demolition of the church by Stanton Renaissance as a “minor alteration” of a heritage structure, leaving the front facade in place with a requirement that any new development incorporate it. The development group told the Sub-Committee that a full assessment of the current condition of the remaining structure is underway by a structural engineer. While there is nothing to indicate structural problems, the Sub-Committee asked questions about scenarios regarding potential structural issues. Hamilton’s Director of Planning and Chief Planner Steve Robichaud, responding to questions from Sub-Committee members that could not be answered until the current condition is known, stated that the City’s planning staff will require the developer to incorporate the facade into the new tower as per the terms of the minor alternation heritage permit. Robichaud stated that the Ontario Building Code does contain provisions for an emergency demolition of the structure if a structural engineer were to find the remaining facade was unstable and posed a danger to public safety; but this would only occur after a peer review. There is no information indicating there are structural issues with the facade, and the discussion only occurred as a hypothetical. Architect Christina Karney of mcCallumSather told the Sub-Committee that the project will require minor variances for some of the changes. Karney, who has worked on the project for mcCallumSather since 2014, explained how the changes fully respect the original heritage permit, ensure the church facade remains the focal point of the new structure as it relates to James Street, and how the lobby of the new building will continue to fully incorporate the facade. Following the meeting, Karney confirmed to The Public Record that the proposed height of the building remains the same as previously approved, and the changes are primarily related to setbacks from James Street and Jackson Street. Hamilton’s Director of Planning and Chief Planner Steve Robichaud said setback variances will have to be considered by the Committee of Adjustment. Following Committee of Adjustment, the development will proceed to final site plan approval by Robichaud and City Hall planning staff. The 2015 Council approval of the project was incorporated into the Downtown Secondary Plan. Great news. Keeping the height and facade. Set backs on James and Jackson might make for an interesting tower. Perhaps a pyramid. It’s going to be a traditional tall building, that’s what is approved. Any changes that are deemed major would require the development to return to the Design Review Panel part of the process.